Ruth McCabe: Open Studio and Sale on Saturday 18th November 2017. The studio and two other rooms will be open, showing both work going back to 2009 when I painted mostly in oils, and the current sketches I’m working on in preparation for two new shows next year, both of which have an environmental theme. This later oil is based on returning to my Yorkshire roots and shows the beginning of a period in which I enjoyed using texture. At this time I would often apply white oil, creating texture with the palette knife, then once dry, rub other pigments onto the textured surface with my finger. Loved it! Boats were a regular subject in these years, loving their rounded forms and general buoyancy! These always sold well and only a few very small works remain like this oil on canvas which was one of a series of pieces painted to show alongside the ceramics of Usch Spettigue. In 2010 I began exploring the medium of watercolour, in a curious response to the combination of struggling through a long long winter of snow and ice which seemed unwilling to let go its grip, followed immediately by the driest April ever, when trees began shedding their leaves to reduce water loss. Somehow this left me wanting to work in a thin, sparing medium and I persevered through a year of frustration (watercolour is so difficult) until I began to achieve pieces I liked. This early watercolour won its way into The Mall Galleries in the Sunday Times 25th Contemporary Watercolour Competition exhibition. I was thrilled, and doubly delighted to find that they’d chosen my piece to use on the cover of their brochure. Continuing since 2011 to develop my practice in the use of watercolour, I am grateful to competitions like the Sunday Times and Royal Watercolour Society’s Contemporary competition, in the hope that these prestigious bodies change the art world’s prejudiced view of ‘watercolour’ as the medium for ‘amateur dabbling’. I love its translucency and flow, and never work in a tight, controlled way. To give you a glimpse of the new work I’m developing for next year, some of which will relate to climate change, rises in sea levels and the role of saltmarsh on the East Anglian coast, here’s a couple of sketches made plein air at a Suffolk site where the marsh is now developing as an intertidal saline habitat following the breach of the sea wall in the tidal surge of 2013. I look forward to welcoming you on the 18th. The studio will be cosy courtesy of my converted calor gas wood burner. During the watercolour demo between 12 and 1pm work can still be bought, and I now have a card payment system. This entry was posted in artworks news and tagged ruth mccabe on November 6, 2017 by admin. Artworks welcomes new applications from professional artists based in East Anglia (Norfolk, Suffolk, Essex and Cambridgeshire), producing contemporary artwork in any medium. All contemporary artwork is considered, including: painting and drawing (oil, acrylic, watercolou, collage and mixed media, original printmaking (such as etching, lithography, woodcut, silkscreen), sculpture and 3D (including stone, bronze, glass, ceramics, metalwork). For the first year, artists joining Artworks are temporary guest members, and thereafter can apply for permanent (full) membership. All artists’ applications are considered on the portfolio of work on selection day, there is no shortlisting or pre-selection, and there is no fee to apply. Read more about exhibiting with Artworks on the APPLY page. This entry was posted in artworks news and tagged artworks, exhibition on October 14, 2017 by admin. 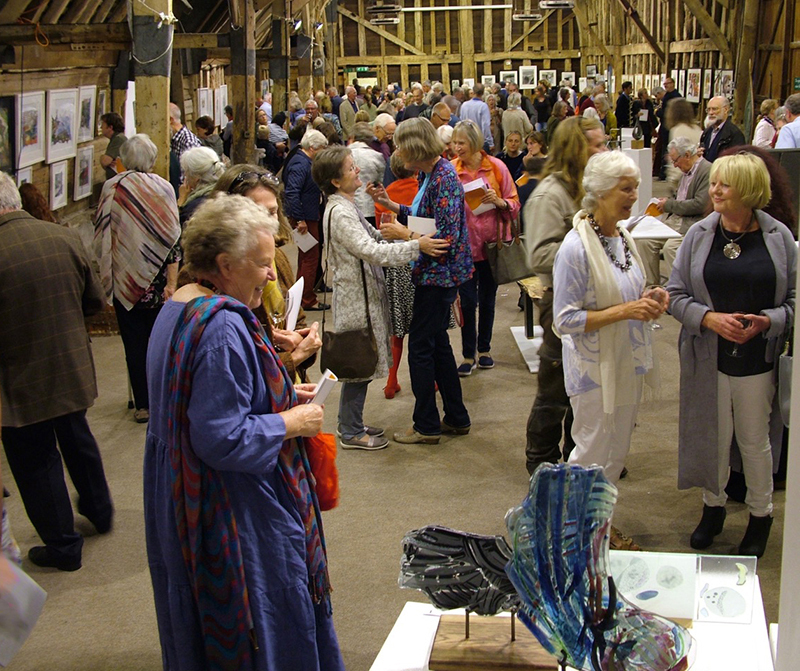 It is the final weekend of ARTWORKS 18th Annual Exhibition at Blackthorpe Barn! Thank you to everyone who has supported Artworks in 2017. If you have not yet visited, we invite you to see the Artworks 2017 exhibition before it closes on Sunday 1st October 2017. For returning visitors, the last weekend is often a quieter occasion to discover many smaller works of art not easily seen at the bustling, crowded Private View evening (click link to see photos). It is also an opportunity to discover some unique art-related gifts by established East Anglian artists, either in the Artworks Shop area or in the many browsers of prints and paintings by the wall displays. Every sale from the exhibition, from a postcard to a large painting or sculpture, will support the creative work of our group of artists. On Saturday 30th September, one of this year’s guest artists, Hazel Bradshaw, will be demonstrating ‘Impractical Pots’, which will be intriguing – pop in to watch some ‘art in action’ – there is no need to book a place and entry is free. At 3pm on Saturday, the Artworks Prize Draw takes place, hosted by Lucy Lutyens. Always a thrilling occasion, this is a chance to win one of thirty original artworks, all generously donated by the artists in Artworks. The prize draw tickets are £2 each. Monies raised from the Artworks Prize Draw will fund next year’s Artists in Schools workshops, and we also donate a proportion of funds raised to a charity – this year we voted to support Teenage Cancer Trust. If you plan to visit ARTWORKS on Sunday (the last day), arrive before 2pm to allow plenty of time to see the whole exhibition. 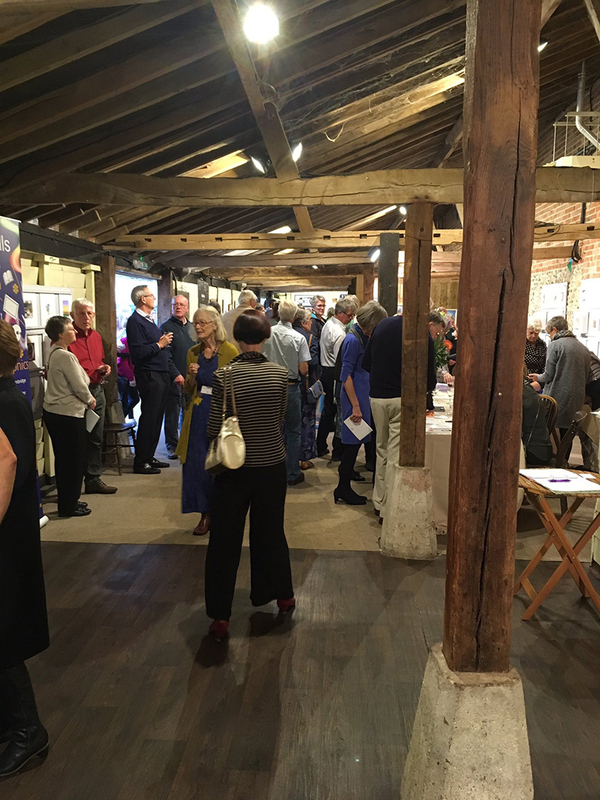 From 3pm on the last day of Artworks, Blackthorpe Barn can get busy as art buyers begin to arrive to collect their purchased artworks. You will probably meet some of the exhibiting artists at this time as we prepare to take down the exhibition. Also on Sunday, Ruth McCabe is the day’s demonstration artist, sharing her distinctive painting processes & techniques with watercolour, all at the demonstration table in the thatched barn, from 10.30am to 4pm. The image below is of Ruth’s new series of watercolours in this year’s exhibition. Lastly, the Artworks Ivy Café is open on Saturday and Sunday for scrumptious homemade cakes, scones and shortbread, pots of tea and brewed coffee. For the more health-conscious, we also have herbal teas and fresh fruit on offer. It is a relaxing space, a little café situated at the end of the long thatched barn, a place to meet up with friends or read through the Artworks catalogue. The Artworks Ivy Café also has a selection of small paintings for sale on the walls. Entry to the Artworks exhibition is free, and our colour exhibition catalogue is also free! Do not miss this last chance to view our annual art exhibition – we believe it’s our best year yet, and from the feedback we have received so far, many visitors agree! Follow us on Twitter @ARTWORKS_east for exhibition updates. Open 10am to 5pm, free entry, complimentary full-colour catalogue. Blackthorpe Barn is on ground level with easy access, free parking. All work in the exhibition is for sale. Payment can be made by cash, cheque, or any of the major credit/debit cards. This entry was posted in artworks news and tagged artworks, artworks shop, demonstrations, exhibition, hazel bradshaw, ruth mccabe on September 29, 2017 by admin. Here is a selection of photographs taken at the ARTWORKS Exhibition private view on Friday 8th September 2017. Artworks was delighted to welcome the new Mayor of St Edmundsbury, Terry Clements, with his wife, to view our annual exhibition. 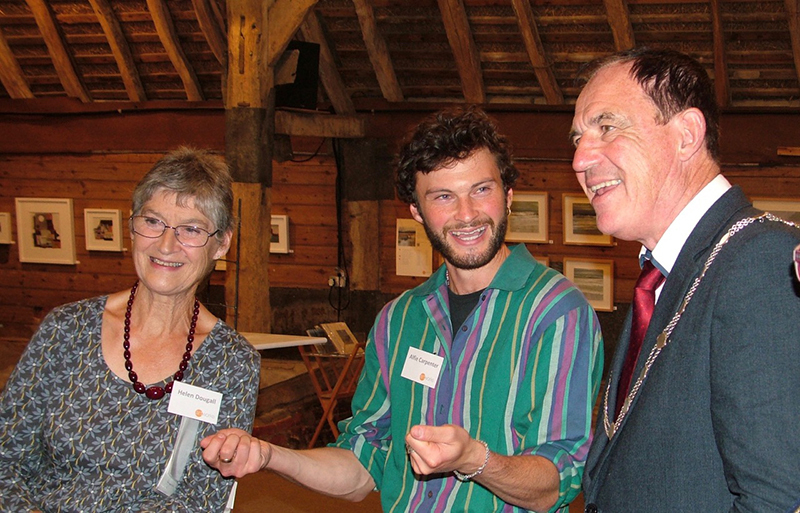 Around 450 people attended the private view, sales were brisk, the atmosphere buzzing and lively. A warm thank you to everyone who attended. We are now into the final week of the ARTWORKS exhibition, open all week 10am-5pm to Sunday 1st October 2017. Follow us on Twitter @ARTWORKS_east for exhibition updates. Relax in the new Artworks Ivy Café, or browse the Artworks Shop for an enticing range of cards and smaller 3D artworks, including ceramics, handmade glass jewellery and metalwork. Browsers of art are also placed next to each artist’s work. This entry was posted in artworks news and tagged artworks, exhibition on September 26, 2017 by admin. A warm welcome to the new artists exhibiting with Artworks in 2017. We welcome back Chris Hann as a full member of Artworks, along with new guest artists Hazel Bradshaw, Sue Caddy, Nicola Coe, Mari French, Nora Gaston and Julia Groves. Eleonora Knowland, Anne Paton and Eileen Revett are taking a year out to pursue other projects, but will be rejoining us in 2018. Exhibition open daily 10am to 5pm, free entry and complimentary full-colour catalogue, free parking. Blackthorpe Barn is on ground level with easy access. Relax in the new Artworks Ivy Café, or browse the Artworks Shop for an enticing range of art cards and smaller artworks, including ceramic pots, handmade glass jewellery and metalwork. This entry was posted in artworks news and tagged artists, chris hann, hazel bradshaw, julia groves, mari french, nicola coe, nora gaston, sue caddy on September 14, 2017 by admin. The popular ‘Meet the Artist’ series of presentations return to Artworks in 2017. A different artist sets up a mini art studio each day, ready to talk about their work or demonstrate creative art techniques. Other artists will be working at the sales desk or in the Artworks’ café, so there are numerous opportunities to meet some of the artists on any day during the Artworks exhibition. Below is the MTA schedule to help you plan your visit to Artworks. Pop in any time between 10.30am and 4.30pm as the art presentations are informal – there is no need to book. Exhibition open daily 10am to 5pm, free entry, complimentary full-colour catalogue, free parking, barn complex is on ground level with easy access. All work in the exhibition is for sale. Relax in the Artworks Café or browse the Artworks Shop for an extensive range of art cards and a range of smaller artworks to buy and take away. This entry was posted in artworks news and tagged demonstrations, meet the artists, mixed media, pres on September 11, 2017 by admin. Ruth McCabe: Open Studio and Sale on Saturday 23rd September 2017. A retrospective showing work in a variety of media, from large to very small will be available to see and buy. Those curious to explore the journey I’ve made since I began to paint in 1997 will be able to enjoy the collection, arranged chronologically. In 2010 I began exploring the medium of watercolour, in a curious response to the combination of struggling through a long long winter of snow and ice which seemed unwilling to let go its grip, followed immediately by the driest April ever, when trees began shedding their leaves to reduce water loss. Somehow this left me wanting to work in a thin, sparing medium and I persevered through a year of frustration (watercolour is so difficult) until I began to achieve pieces I liked. This early watercolour won its way into The Mall Galleries in the Sunday Times 25th Contemporary Watercolour Competition exhibition. I was thrilled, and doubly delighted to find that they’d chosen my piece to use on the cover of their brochure. How I wish this had led to some interest from a London gallery. So please come and visit the studio and the two additional spaces I will be setting up to show this collection. I hope to make it an interesting journey for you. There will also be unframed pieces, cards and some wire works. Look for the signs to get you to me! Come straight to the studio. During the painting demo (see poster below), work can still be seen in the cottage. 11am to 12 noon Watercolour demo in the studio: working loosely with this medium. Please email ruth@threeways.mail1.co.uk to book your place since due to space restrictions, only 6 places available, £3.00 per person. All visitors please come straight to the studio. Other rooms of work will be open for browsing during the demo if you arrive while that is taking place. This entry was posted in artworks news and tagged demonstrations, landscapes, ruth mccabe, suffolk, watercolours on August 8, 2017 by admin. Anne Paton and Jazz Green, two artists in Artworks, together with three other Suffolk painters, have organised a new art exhibition to be held over the Spring Holiday weekend of 27-29 May 2017 in Walberswick. A new exhibition featuring work by five established East Anglian Artists: Geoffrey Chatten RBA, Miles Fairhurst, Jazz Green, Julie Noad and Anne Paton. Walberswick is a pretty village on the Suffolk coast, a popular location for coastal walkers, plein-air painters and other artists. The art exhibition is at Walberswick Village Hall for three days only, over the Late Spring Holiday weekend of 27th, 28th & 29th May 2017. Open Saturday, Sunday and Monday from 10am to 6pm. Free admission. Free parking at Village Hall for visitors to the art exhibition, or pay & display at either the boatyard or dunes car parks. Directions: Follow road signs to Walberswick from Blythburgh on the A12. The Village Hall is centrally located opposite the village green, next to the access road to the dunes car park. Free Entry. Exhibition open: 10am – 6pm on Saturday, Sunday & Monday. Credit-card facilities available. Free Admission. Ground floor access. This entry was posted in artworks news and tagged exhibition, paintings, suffolk on May 23, 2017 by admin. Thursday 11th May to Wednesday 17th May 2017, open 10am to 5pm daily. The Garage Gallery, Aldeburgh (below Peter Pears Gallery, 152 High Street Aldeburgh, IP15 5AQ). An exhibition of four Suffolk Artists: Cyndi Speer (paintings); Carol Pask (ceramics); Gillian Plummer (photography); Naomi Brangwyn (glass). This entry was posted in artworks news and tagged aldeburgh, carol pask, ceramics, exhibition on May 12, 2017 by admin.